With confirmation earlier today that Sepang International Circuit has reached an agreement with the Angel Nieto Team to run a MotoGP two-rider lineup beginning next year on Yamaha M1 machinery, speculation turns to the identity of the riders. Those two riders are believed to be Dani Pedrosa and Franco Morbidelli. Running Ducatis under the Aspar team name this year with two MotoGP seats currently occupied by Alvaro Bautista and Karel Abraham, team owner Jorge Martinez was reportedly quick to accept the new relationship with SIC and assign his two grid spots to the new team. 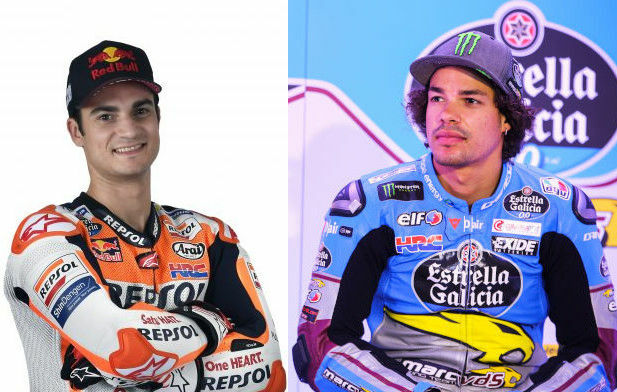 Dani Pedrosa is ending his lengthy and successful relationship with Repsol Honda this year, while Franco Morbidelli will be leaving the Marc VDS Team. Morbidelli is a very talented young rider and, together with Pedrosa, could give the new team a real punch. The rider lineup for the new team is expected to be formally announced at the German MotoGP round next week. Stay tuned. Dani is/will be a non factor in the Championship, his time/opportunity is past. However like Hayden, he is a genuinely nice guy, well liked in MotoGP circles, who knows how to ride and develop a motorcycle. As VLJ has mentioned in the past, he is a hero in Spain,(that’s got to help Yamaha sales where the other Spanish hero rides a Honda). He is one of the top finishing/points scoring riders of all time in MotoGP, and it can’t hurt to spend a couple mill on Pedrosa to help show (1) that the team is serious, (2) that he can help teach/develop not only the bike but Morbidelli for a year or two, and (3) rather than spend that money on another no name that also won’t be a factor in the championship. Like those who said Rossi was washed up and should retire after his stint at Ducati, and those who said if Rossi had the drive and desire to race motorcycles, he should be allowed, encouraged even, well, the same goes for Pedrosa. If he wants to race and can find a ride, more power to him. It worked out pretty well for Rossi, maybe it will work out ok for Dani as well.If he can immediately start putting the new satellite team in the top 10,( it certainly won’t be on the podium) I imagine that would be worth the investment to them. If Dani does retire, it will be a retirement well deserved. 18 years in GP, 3 World Titles.30 something premier class wins, and one of the best records in MotoGP. No, he never won a the title in the premier class, but then a lot of other really talented riders haven’t either.he’s certainly been close a few times. (Buzzard luck). BTW Rossi hasn’t won one in nearly a decade, and unless something bad happens to Marquez, it’s likely he won’t ever win another. I was wondering where you went. You haven’t posted here much lately. Everything okay? As for Rossi, I will forever remain pissed about 2015. Man, he had that one…. I like Pedrosa and have been rooting him on for years. Why in the world would a potential switch to a satellite Yamaha team grant him success? Lets see Yamaha hasn’t won a race in over a year. This is with Rossi,Vinales and Zarco as riders! Pretty stellar group to say the least. Now all of a sudden Pedrosa will start winning races for Yamaha? I just don’t see this happening. I don’t think anyone at Yamaha is under the illusion that Pedrosa on a satellite-effort machine is the secret sauce they have been missing. If those three riders you mentioned can’t win a race, Yamaha knows the issue isn’t one of rider talent. If it turns out that they did sign Pedrosa, I’m sure the logic was that he is a high-profile rider with a history of hitting the podium with some regularity. They are basically hoping he’ll produce some Zarco-ish results and buzz. Seems if Pedrosa wanted to ride the M1 that they would have announced him with the formation of the team. I think he was going to announce retirement before, and they asked him to keep a lid on it until the satellite Yamaha was announced. I would take Morbidelli for 2 years, and Bautista for 1. If I am allowed to dream I would take Rea instead of Bautista. Has Hafizh Syahrin signed with Tech 3/KTM for next year? It would seem that SIC might entertain him for one of their bikes. I would like to see Dani on a M1 kicking the Lily white arse of the “GOAT”. Dani is already a non-factor on the Repsol Honda, a lesser version of which Cal Crutchlow has ridden to victory in a dry race this season. Dani has ridden a Repsol Honda for thirteen years. He knows his bike and team like the back of his hand. As badly as he’s floundering now, he’s going to flounder even worse on an unfamiliar, underpowered satellite bike from another manufacturer. You want to know how Dani will fare next year, assuming he gets the Yamaha satellite ride? Think Hafizh Syahrin, only less aggressive. Yep, you may as well get used to the idea that the only time Dani Pedrosa will be seeing Rossi on the track next year will be when they line up on the grid, with Dani eyeing #46 from three rows back. Once the flag drops, he’s going to get swallowed up in the rushing chaos, never to be heard from again. Minus his Repsol Honda safety blanket, the inevitable downward career arc that rightfully should have have run its course at least five years ago is finally going to claim #26. Yes, he’s already signed on with Tech3. That’s a fairly strong team if the bike is competitive and Morbidelli gets his legs under him. Will the Yamaha’s be competitive is the only after thought. I know Rossi has done OK this year, but probably more due to talent than exceptionally competitive machinery. Morbidelli already has one seat wrapped up from what I understand. Pedrosa just announced the other day that he’ll hold a press conference at the next race to announce his future direction. His sudden knowledge of that direction is probably directly related to the confirmation tgat the new satellite Yamaha team will actually exist next year. Of course that could easily mean he didn’t get the seat as much as he did. Suzuki was rumored to have turned down Pedrosa’s salary demands. Maybe the satellite Yamaha team did too. He hasn’t been making a good show lately to have much leverage. Still, with both Lorenzo and Marquez lining up for team Repsol Honda, Yamaha may indeed be willing to pay the money to get someone of Pedrosa’s experience and history of running at the front on their bike. FYI…the Aspar team run year-old 2017 Ducati’s this season. Yes, true today. But neither will be in 2019. They need to smuggle a couple of engines from their current bikes to put into their new steeds. Yamaha is sitting 2-4 in the championship & Morbidelli rarely sees the front half of the group, so I doubt he’ll miss much, if anything, about his Honda. Yamaha’s engines are just fine. Agree. Yamaha is winning the championship in the non-Marquez category.